Wilms tumor is part of the WAGR complex which consists of Wilms tumor, aniridia, genitourinary malformation and retardation of the mental motor. Aniridia is also known as absence of the iris. Wilms tumor carries a good prognosis. Wilms tumor may present with abdominal pain,unilateral muscular hypertrophy, hypertension and intestinal obstruction. 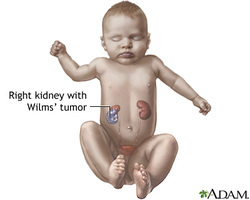 Wilms tumor mostly affecting young children ( 2- 5 years old). Wilms tumor present with large, solitary, palpable well circumscribed renal mass in the flank region of the abdomen. The renal mass is originating from the primitive metanephric tissue. Patient may also present with microscopic hematuria. Wilms tumor is caused by mutation on the short arm of chromosome 11 ( 11p) which lead to deletion of the expression of the WT-1 gene. WT-1 gene is a tumor suppressor gene. There will be present of mesenchymal elements such as connective tissue, cartilage and bones and immature stroma with primitive tubules and glomeruli. The treatment of Wilms tumor may include surgical resection of the tumor, radiation therapy and the use of chemotherapeutic agent ( vincristine and actinomycin D). 1.Knudson, Alfred G., and Louise C. Strons. "Mutation and cancer: a model for Wilms' tumor of the kidney." Journal of the National Cancer Institute 48.2 (1972): 313-324. 2.Beckwith, J. B., and N. F. Palmer. "Histopathology and prognosis of Wilms tumor results from the first National Wilms' Tumor Study." Cancer 41.5 (1978): 1937-1948.